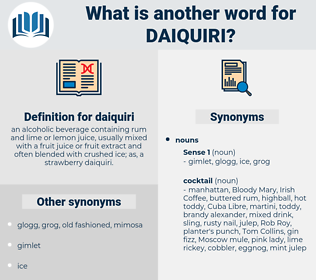 What is another word for daiquiri? 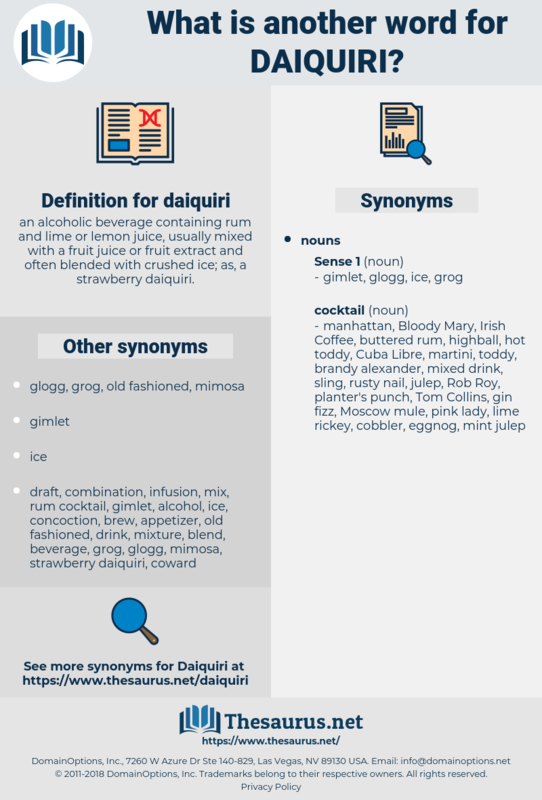 an alcoholic beverage containing rum and lime or lemon juice, usually mixed with a fruit juice or fruit extract and often blended with crushed ice; as, a strawberry daiquiri. daycare, dowser, disc harrow, dakar, digger, disk harrow, decker, desire, degree, deicer, disagree, deck chair, decor, disarray, descry, due care, dodger, death chair, day care, dosser, decry, dagger, De Saussure, dioscorea, dowitcher, dicker, dishwasher, dasyure, dishware, dog-ear, decree, dekker, Dies Irae, disk error, dish washer, dowager, de jure, dysuria, dozer, doojigger, dicer, docker, dossier, daguerre.